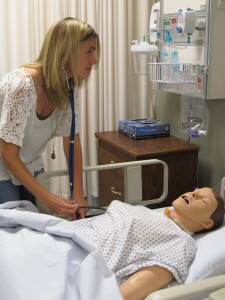 Nursing student Abbey Feltz checks blood pressure on a mannequin in the Hunter Hall clinical laboratory. Photo by Melinda Frank. Reading, writing and arithmetic are the three basic fundamentals of learning, but what about compassion, Christ-likeness and confidence? These equally important fundamentals of nursing are all exhibited in Abbey Feltz, a senior nursing student from Celina, Ohio. Feltz describes her college career at MVNU as “a whirlwind experience.” The intense nursing workload gave her an appreciation for the learning envi- ronment a small school offers. That one-on-one connection is necessary, according to Feltz. A demanding schedule did not stop Feltz from participating in community life. In her time at MVNU, she has served as small group leader, lab assis- tant, Resident Health Advisor and a member of the Society of Cougar Nurses. Nursing was not always her first choice. “For most of my life I didn’t want to be a nurse,” admitted Feltz. A high school athletic training class changed that. While piquing her inter- est in God’s intricate design of the human body, the class also brought nursing to mind. She quickly learned that faith plays a role in nursing far beyond biological design. The emphasis on Christ-like service makes the nursing program at MVNU different from programs at other institutions. Last spring break, Feltz had the opportunity to combine service and nursing by traveling to Haiti for a mission trip. Serving in Haiti was “very eye-opening,” Feltz said. The opportunity to serve alongside other nursing students and faculty gave her a new outlook on the importance of stepping out of her comfort zone. A highlight of Feltz’s time at MVNU has been the friendships she has formed. “I get so much joy just being with people,” Feltz said. Whether driving to clinicals with fellow nursing majors or caring for her patients, Feltz’s willingness to get to know and help others is a testament to her caring nature. Clinical rotations fueled her passion for women’s health, especially obstetrics. While learning practical nursing skills, Feltz has been able to put her faith into action. MVNU has given her the opportunity to grow academically, relationally and spiritually. The faith-based community of MVNU has had a foundational impact on Feltz’s life. faith transfers to her academic life as well. “Academically, I have been pushed further than I ever thought I could go. I have a sense of confidence about what I can accomplish now,” Feltz said. After graduation Feltz will take the certification exam to become a Registered Nurse. Her dream job is to work in the maternity ward at Riverside Methodist Hospital in Columbus. Feltz will graduate in the spring with confidence that she is serving as Christ served.